This satin steel (met) SUV has an automatic transmission and is powered by a 302HP 3.6L V6 Cylinder Engine. Our Enclave's trim level is Essence AWD. This entry level Buick Enclave was built for luxury. Interior convenience and comfort comes from blind spot monitoring with lane change alert and rear cross traffic alert, rear parking assistance, customizable Driver Information Centre with colour display, 4G WiFi, active noise cancellation, Buick Connected Access with OnStar capability, heated power front seats, auto dimming rear view mirror, hands free keyless entry, rear view camera, remote start, leather steering wheel with audio and cruise controls, and rear climate controls while an infotainment system with an 8 inch touchscreen, Apple CarPlay and Android Auto, Siri Eyes Free and voice recognition, SiriusXM, Bluetooth, and USB and aux jacks keep you connected. 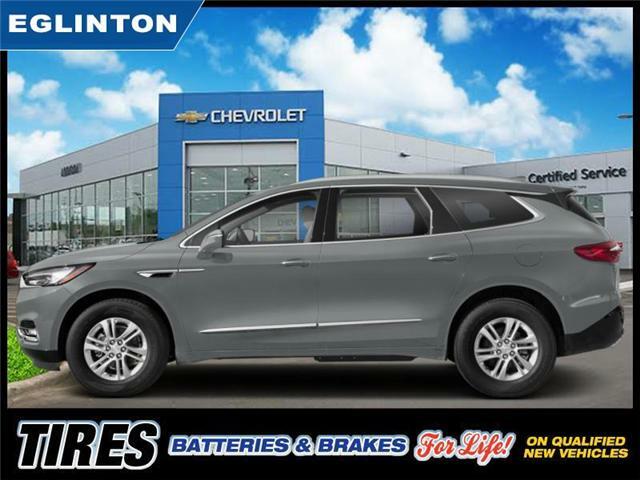 This Enclave also has impeccable exterior style, dual exhaust outlet, aluminum wheels, hands free power programmable liftgate heated power side mirrors with turn signals, and LED lighting. This vehicle has been upgraded with the following features: Leather Seats - Perforated, Essence. Buy this vehicle now for the lowest bi-weekly payment of $302.83 with $0 down for 84 months @ 0.99% APR O.A.C. ( Plus applicable taxes - $299 documentation fee ). Incentives expire 2019-04-30. See dealer for details.